potentially nervous: love the bun you're with. love the bun you're with. it's been a very sad week here in the bunosphere. little sweet hans has left us. his family is grieving and we mourn with them as such a precious soul will be missed dearly by all. so please let's all take that extra time out to love up our bunnies extra long and special. and remember god loves these fragile creatures as much as we do, and it any time at all he may call them home. to the almighty furrybutts we send our love and prayers. AWWWWWWW. OMG. How precious are Bells and Nuage?! So good to see their little faces again! So well said. Sweet, sweet picture. Yes, we miss Hans too and send love to wonderful bunmom FB. Bells' face is just so lovable, of course, Nuage feels the same. How very true - it's been so sad to hear. Buns are just so fragile and that time really is very golden and precious. Beautiful photo of Nuage and Bells. What a sweet picture. We're still mourning Hans over here. We all know these precious creatures are just on loan to us, but it feels so unfair that we don't get to enjoy them longer. Love each and every day with them. Each day is a gift. What a lovely picture. 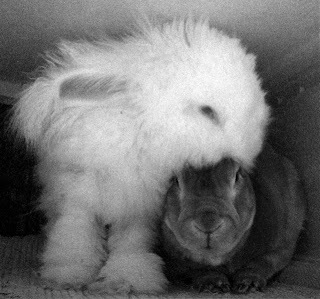 Bunnies snuggling each other is such a sweet sight.